Tall and fair, the race of elves - as well as their various subtypes and families - are graceful and beautiful, often very proud. They dwell in forested areas and excel in many fields, depending on the individual's strengths and weaknesses. Very powerful in both magic and physical might, elves and drow are excellent allies of the light. Location Found:: Forested areas, mostly - though can be found abroad. Species info credited to Blazeh/Verridith, Aehryn, and Fyfergrund. Appearance Heartwoodian elves/High elves; The high elf, or Heartwoodian/Evylonian elf, is perhaps the most fair of all elven races; taller than the Vystrian with generally fair hair and brightly-colored eyes, though skin color can range from very pale to very dark. Most high elves are usually garbed in green or gold fabric, in delicate and well-made clothes that are often elegant and pleasing in design. Some elves, though especially those rangers who protect their kin from the dangers of the world, will often wear gilded armor underneath thick traveling cloaks, inlaid with various types of metal. Many elven weapons are hand-crafted by skilled smiths and designers, with skill unparalleled and matched by very few. Highborn elves often sport jewelry made in gold and silver, divine metal, and mythril, while carrying items made of dragonsung steel. 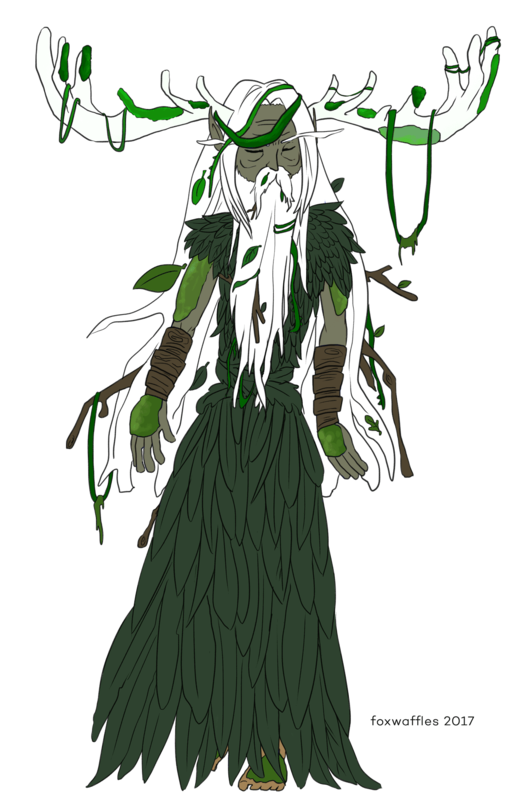 Vystrian elves; A relative of the high elf, Vystrian elves are often called wood elves, or forest elves, and reside primarily in the forests of Vystriana, Felnova. Darker haired, usually brown or black, their locks are shorter in length than their Heartwoodian brethren. Clothed in garments of silver and grey, with little footwear and sparse armor, they are also somewhat shorter with ears not as pointed as the Heartwoodians, allowing them to masquerade as humans more often than not. 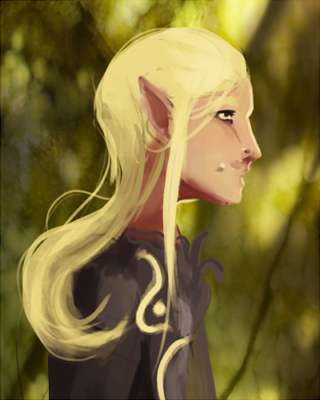 Darker-skinned elves may be found more often in the forests of Felnova, and nobles wear gold above most other metals, accenting clothes in a vast array of beautiful colors. Dark elf (elder); The elder bloodline of the drow, or dark elf, is a unique one; descended from high elves in Evylon, elder drow have hair in the darkest shades of brown and black, with eyes lightly colored and not nearly as intense. They are tall and pale-skinned, and trend towards wearing darker colors, as well as darksteel or dragonsung steel armor. Elder drow are fond of silver jewelry and subtle accents, as well as intricate and beautiful arms of all types. Dark elf (younger); Born of a cataclysm across the Yorijian sea, the younger bloodline of dark elf are dark of skin and light of hair, with very bright and intense color in their eyes. They are tall and lanky, with long hair and a great variety of clothing and armor, though they seem to be most fond of using gemstones in bright colors in any jewelry they craft. Masters of stealth, able to see even in the darkest shadows, youngblooded drow often employ Kuraian weapons hidden within their clothes. Culture High elves; High elves, though peaceable and warm in times without war, are greatly protective of their families and wherever they have made their home. When those they care for are threatened, they will rise to war or fly to the aid of allies, using their swift arrows and keen blades to sever life from those who threaten what they hold dear. The Heartwoodians are noted to be one of the most caring types of elf, and the most loyal, though they are proud and strong among their own kind. The sense of honor most high elven settlements hold is as strong as any dragon's. Vystrian elves; The Vystrian elf is a secretive and mysterious race. Straying from war and sometimes ignoring the cry of allies in need, they are fiercely protective of their own lives and hold pride and honor above all else. Because they have suffered many losses to the ravages of war, the Vystrian elf will avoid it at all costs, though to gain the trust of one is to gain a great ally. If the need is dire, they will come to another's aid. Dark elves (elder); Despite their history of violence with their Heartwoodian brethren, the elder line of drow is noble and takes their highborn brothers' compassion deeply to heart. Many are kind, and wish only to live in peace where they have settled. Many of these become dragonriders, honored among all. Both bloodlines hold a dark centuries-long feud with the deathcats to the south, and all vow vengeance to their destruction. Dark elves (younger); The youngblooded drow generally value the ability to fight above all else, many joining the regimented military ruled over by the Authoritarians of D'issan, some of the most skilled fighters in Vystrian history. Some of these drow are rumored to have the weapon-making skills rivaling that of the dwarves and dragons, and they are known for always marking whatever they may craft. Both bloodlines hold a dark centuries-long feud with the deathcats to the south, and all vow vengeance to their destruction. Abilities High elves; It is known that Heartwoodian archers are unparalleled in the art of the bow, rivaled by none; not even other elves of different bloodlines. Their skills at magic are very great, especially in the element of light, and many great healers have come from high elven blood. Heartwoodians are noted for their stealth, and the rangers of Evylon's elven armies train for years to become such. They can move undetected beyond most races' ability to sense them, and can sink an arrow into an enemy's skull from greater distance than most. Vystrian elves; Vystrian elves value magic above all else in war, and many become mages, mastering anything from the arcane arts to elemancy and more. Seers are prolific, as well as enchanters and disenchanters, including those who have learned to craft and bespell types of metals and gems. Dark elves (elder); The elderblooded dark elves specialize in elemental magic and reiatsu use over all, and were the first to craft Leanfir: an elemental magic bound to the drowish language. Physically, the elder dark elves are weaker than the other subtypes, but have been known to grow into capable warriors fleet of foot and swift of mind. Dark elves (younger); Unlike their elderblooded cousins, the ability to wield a sword with utmost skill falls to that of this bloodline. Most train from childhood to wield a variety of weapons, and hone their skills until they can physically train no more. They are stronger physically than most other elves, though not quite as fast, favoring strength over speed. After the destruction of the One and the split from a single god into the Ten, the gods laboured in secret to craft new species into their war-torn world. Scylla, mourning the darkness of the skies, was approached one evening by Balion - the god of nature and all living things. He proposed something that might drive away her despair, and give light to the tortured world around them. A race of beautiful, arcane beings; a race that, though physical, was as graceful and ethereal as the gods themselves. Balion wound a slender form from vines and leaves as Scylla agreed, excitement coloring her luminous eyes. She took the raindrops that fell and caught the sunlight that streamed through the clouds, and brought them back in a bowl made of clouds. Weaving the water, she softened the sharp edges that Balion had crafted, and painted the form with sunlight, giving the first elf fair skin and hair. She plucked a little of the sky's aura to give the elf bright, keen eyes, and spun a little of the wind for speed and strength. Balion smiled as the first elf beheld the world, shocked at the chaos that reigned outside. Embrace beauty, and walk not in darkness, Scylla cautioned, You are the light that guards the forests, you are the keeper that protects those under the trees. Build your armies strong, young elf; and await our command. Your hardships will be many, and last for some time, Balion rumbled quietly. I have but one gift left to give you. You, and all of your people, will find kinship with animals great and small - and a small number of you may kindle within yourselves the spirit of one such animal, to help you through the great night. To you, I will grant the affinity of the stag; let his light guide you, always. The first elf was also a druid, with the affinity for a beautiful white stag; he was granted people to rule over, woven by Scylla's and Balion's claws. A King for many years, it is said that his bloodline is lost forevermore, though his power echoes still in Heartwood's deepest depths. Name: Athenus'oryf. Location: sleeps within the Tree of Memories in Evylon. Status: Alive. The elven Ancient First is an old, wrinkled druid-elf affiliated with the spirit of a great stag. He has a long white beard tangled with vines, and slightly tinted green skin; antlers poke from long, white hair tangled with vines and leaves and branches. Moss crawls along his hands, arms, chest, and legs. He wears robes made of giant, woven leaves, spelled to be as flexible and sturdy as fabric, with wooden bracers on both arms. His eyes are white and blind, almost always closed, in a near-constant state of meditation. When standing, he's seven feet tall, eight and a half with the span of his white, vine-and-moss covered antlers. As the First Elf, he is incredibly old, and can often be found meditating within the Tree of Memories, guarded by his Sage. His thoughts are swift, but actions and decisions slow, consciousness split through the lives of all trees, plants, and animals covering miles and miles of Heartwood and the surrounding countryside. His influence has a focal point in the tree that's grown up around and over him; the Tree of Memories stores mental images within its vast consciousness, allowing visitors to view visions of their past by touching its gnarled bark. Cannot be easily roused, and does not move when he is; speaks through telepathy, unless in extravagant need. Very, very rarely opens his eyes. Classification: deep-dwelling drow. Location: far underground; though otherwise abroad. The night elf, or deep drow, is a race of subterranean-dwelling drow that have completely forsaken the light their cousins still cling to. With pitch-black skin and long hair that can range anywhere from a deep red to silvery white, their bright eyes have adapted to see heat signatures given off, glowing scarlet whenever this ability is tapped into. The sun, torchlight, any light brighter than the faint mage-stones that they utilize beneath the earth can harm their sight, and sometimes drive them to blindness. These deep drow were given the name of night elves for their venturing to the surface world only at night; this is when they may hunt or trade, before withdrawing back to their underground sanctuaries. Classification: pure light-infused elf. Location: primarily Felnova and Evylon, can be found elsewhere. The pure elf, as opposed to the two bloodlines of drow and the high elves of Felnova and Evylon, is a rare occurrence in the offspring of younger-line dark elves. Once the founders of the younger bloodline, the pure elves of Alubria embraced the light as the embodiment of all things, good and evil; darkness was a thing to be abhorred. A cataclysmic finale to a war long-fought stole away the pure elves' light, destroyed it, leaving them as the dark-skinned, white-haired drow all know of today. Few pure elves are born every few years; with white skin, white hair and long, thin ears, they could be considered one of the fairest subtypes of elf found in any Realm. Their bright eyes glow with soft luminescence, and can be any color, though are usually very saturated. The glow brightens and dims to their emotions. Pure elves may also control other elements, though darkness and shadow is unknown to them; all have a proficiency in light, and many more are able to wield it with an ease evasive to most. Regarded with a mixture of shock, disgust and awe among their dark-elven brethren, they still garner respect for their wielding of the darkness' eternal enemy - though because of the distrust built between the two factions, most pure elves leave their dark-skinned parents upon turning old enough to strike out on their own. Classification: long-eared elves adapted to living underground. Location: Ristell's Underground. Unable to withstand living on the harsh surface of Ristell, the high elves moved underground to live side by side with their drow cousins. However, to compensate for the darkness which rendered their sharp eyesight largely ineffective, their ears started to grow in size to grant them superior hearing. But, as their large ears began to resemble those of some xeriin, the elves used their magic to reshape their ears into a longer, more slender appearance, three to five times as long as typical elf ears, which allow them to hunt effectively even when they can't see their prey. However, other other elves tend to snub them for their 'flawed' appearance.